It is becoming increasingly clear that the sanctions won’t be enough to cause the Iranian government to halt its nuclear program. No one can predict exactly when or how Iran will wave the white flag and stop its pursuit of nuclear weapons. While the sanctions are stifling the Iranian economy, they are simply not enough the defeat the Iranians. The western countries that are imposing the sanctions are in dire economic straits and are focusing on their domestic problems. The Iranian nuclear program is regarded as a major threat, but the West considers it a future threat, and for now these countries' internal problems are taking precedence over Iran's nuclear ambitions. The US has the means to launch an efficient military strike. They have intelligence, stealth bombers that cannot be detected by radars, ballistic and cruise missiles, bunker buster bombs, as well as electronic warfare and aerial refueling capabilities. 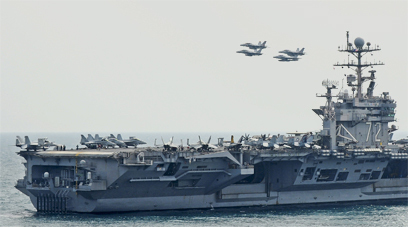 The Americans can surround Iran with army forces, they have airfields and aircraft carriers from which reinforcements can be scrambled at a moment's notice, and, in general, their level of preparedness is very high. In the attack on the Iraqi nuclear reactor in 1981, it was determined in advance that the destruction will be achieved with a short, pinpoint surprise attack. The expectation was that the strike would set the Iraqi nuclear program several years back – or even stop it entirely. In Iran's case, there are no plans for a surprise, pinpoint attack, but for an ongoing type of operation in which the damage will be inflicted gradually. The US possesses the necessary military staying power to carry out such an operation over the course of several days, and even weeks, assuming the political echelon would support it. Ground forces will not be required. The mission is simple: Mounting destruction and attrition until the nuclear program is halted. The US has the diplomatic standing and the means to accompany such an operation with direct or indirect negotiations. This was Kennedy's modus operandi during the Cuban Missile Crisis, which began on October 15, 1962 and ended just 13 days later. The overt preparations for a military operation and the deployment of forces, which accompanied the naval blockade of Cuba, deterred the Soviets and drew the attention of the entire world, which feared the worst. Prime Minister Netanyahu declared that a nuclear Iran would pose an existential threat to Israel. Curbing this threat requires a combination of harsh sanctions, an ongoing military campaign and diplomacy. Iran's response will surely include Israel, meaning that the Jewish state will be a part of this campaign in any case. Therefore, the solution calls for cooperation between Israel and the US. Otherwise, we will be forced to live under the threat of a nuclear Iran. See all talkbacks "It won’t work without the Americans"